There was only one big story this week: snow. A chance to take a day off work, dust down the sledge and saucily ask: "How many inches did you get last night?" Steven Fry Twitters his way out of a Centrepoint lift. Still time to enter our competition to win a box set of ye olde London maps. We tried out an experiment in gastronomic remuneration: the Little Bay pay-what-you-like contrivance. Fibs are back - as in 6-line poems whose syllables follow the Fibonacci sequence (1-1-2-3-5-8). Win tickets to the London Word Festival by submitting your verses. One week to Valentine's Day. Yes, really. Here are a few ideas. Messrs Crockatt & Powell, of independent bookshop fame, tell us why they're doomed. Check out the Arts and Events tag for more. Images clockwise from top left: Blackbird by FlapperSnapper, apologetic display by Tim*A, as slippery as a banana on ice by SallyB2, and a frosty roundel by Johncockley. 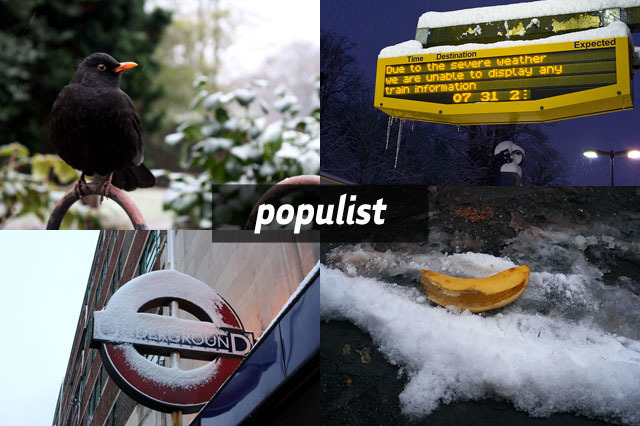 Keep track of our most popular posts by checking out Favourites or using the Populist tag.